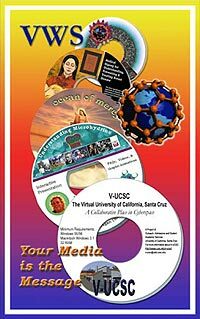 CD-ROM, DVD and WWW website design are the evolving standards of communication in our age. Video content is the raw material from which the riches of these new media are mined. The Virtual World Studio creates media delivered in all or any of these delivery systems, depending on our clients' needs. We cover all the bases. We have created for our clients such diverse digital media products as television pilots, one minute commercials, video light shows, event webcasts, location interviews, infomercials, sales presentations, instruction manuals, documentaries, travel memoires, behind-the-scenes and personal promotion campaigns... and even a wedding and a family geneology video in the mix. These projects have been delivered via video tape, website, CD-ROM, and DVD. We also handled the packaging design and printing when needed. Our Studio has mass duplicators and on-disc printing, should the need arise for a few hundred or thousand of a particular media product. We are also experienced in media management, should you require knowledgeable interface with printers or large scale manufacturers of this media. DVD authoring is our newest delivery technology, ideal for presenting video clips in both linear and a non-linear fashion. For authoring DVD's we use DVD-it! and Pinnacle Impression DVD-Pro. Both give you lots of options for creating custom DVD layouts in artistic and professional ways. Pinnacle's DVD-Pro also allows animated menu's, a hot new feature typically seen on only the highest end DVD's. Our years of experience, and our state of the art digital studio let us deliver these services at extraordinarily low prices, and top quality. Let us know your needs and we'll give you an estimate.